It’s finally December-rrrrrr (rrrrr because it’s cold) and I’ve decided to introduce a whole new series to my blog and Youtube channel – my monthly beauty review. Basically I’m going to talk about all the beauty products I have been using and loving that month as well as the things I haven’t enjoyed so much to give you guys a good round up of all the things I’ve been throwing at my face recently. Once Christmas is out of the way again, hopefully I’ll have some spare money to treat myself to some new products so I can introduce some more variation to the mix – I don’t want you guys getting bored because you’re seeing the same products appearing over and over again! 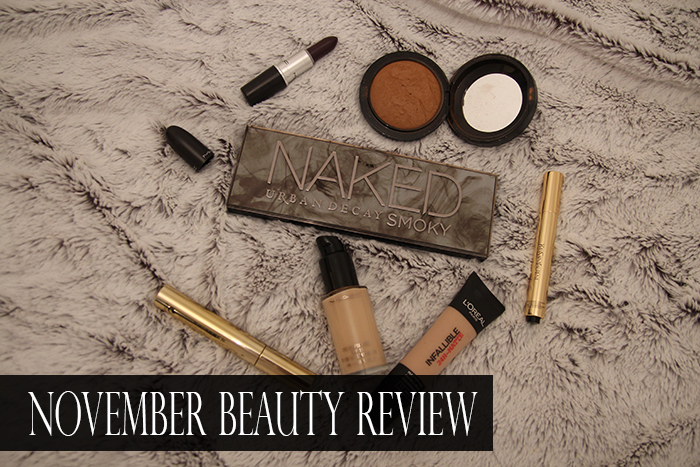 There’s a good mixture of skin care and beauty in this month’s review, as well as high street and high end products so I’d like to say there’s something for everyone! Remember to subscribe to my channel if you enjoy this video and would like to see more – I’m also attempting Vlogmas for the first time this December although I am doing weekly vlogs rather than daily because ain’t nobody got time for that. (Also my life is too boring).